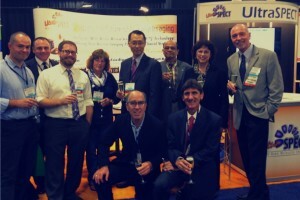 Auburndale, Mass., October 3, 2014 – UltraSPECT, provider of the only multi-vendor and most cost-effective solutions for meeting the American Society of Nuclear Cardiology (ASNC) low-dose guidelines, announces today the recipients of the first annual ASNC Technologist Travel Awards. Seven technologists received complementary conference registration and travel stipends to attend the 19th Annual Scientific Session of the American Society of Nuclear Cardiology (ASNC) in Boston, which started Thursday, September 18 and continues through Sunday, September 21. The seven recipients were selected for their leadership and involvement in the ASNC organization at both the local and national level. They are active speakers, researchers and consultants, who have investigated a range of topics including motion in imaging; multi-modality imaging; stress/rest protocols; and the issue of low dose for nuclear medicine. The mission for dose reduction and safer imaging is as critical as ever, with not only the ASNC low dose imaging guidelines in effect as of January 1st, but also the CMS push towards quality over volume in healthcare in the coming months through the Physician Quality Reporting System (PQRS) program. A transition to quality in nuclear medicine equates to a transition to low dose. To view images of the ASNC Travel Grant recipients, visit http://ultraspect.com/uncategorized/asnc-2014/. For more information on UltraSPECT technologies and reducing dose in nuclear medicine, visit www.ultraspect.com or call 1-888-WBR-SCAN (1-888-927-7226).